One day, a fire spirit was curious about the other elements and decided to walk their places. She danced up into the air to see the spirits that could fly. But it did not really work. The flying spirits were afraid of her and pushed her to the ground, but she left her fire in the air. So they learned to dance and were a little bit ashamed that they treated the one who brought the gift so bad. The fire spirit landed where the creature walked. Those creatures were bound by gravity and cautious about the fire. But they tried to use these gifts the spirit brought. The fire spirit like these slow walkers but longed to see her fellow dancers, so she walked to find them again. Led by the same instinct that makes birds find north and south she danced over the earth to find home. But then the land ended and became water. By another instinct the dancer knew this was an element to kill her. The powers living in the water felt the same and stayed clear of her. So she started to dance at the shore of the ocean to evaporate the water. As you can imagine, it didn’t work. At times the fire spirit can be seen dancing fast over the land she is trapped on, but she always stops when there is water. But you can always see her gift to the earth when you see someone dance. The first one is a stunning gown over and over made of feathers, matching the raven theme. The mesh corset, that makes that awesome waist is textured with an amazing filigree texture and because of the mesh it moves perfect with every turn and twist of your upper body. The skirt, back piece and the incredible chest piece are awesome flexible feathers and the huge neck part and the little delicate brooch that hold the chest feathers give the whole gown a super elegant touch. On top Raven made some amazing earrings that come with the gown! The casual outfit of the “Raven Collection” comes with 3 different possibilities to wear it. The top you can choose from an opaque black to a sheer black with the silver ornaments on or you even just wear only the bra with no top under it at all. The mesh corset highlights the shape of every fashionista perfectly with the wonderful light stripes and the mesh pants make an amazing look that still has a touch of elegance, even if you can wear it as a casual attire. 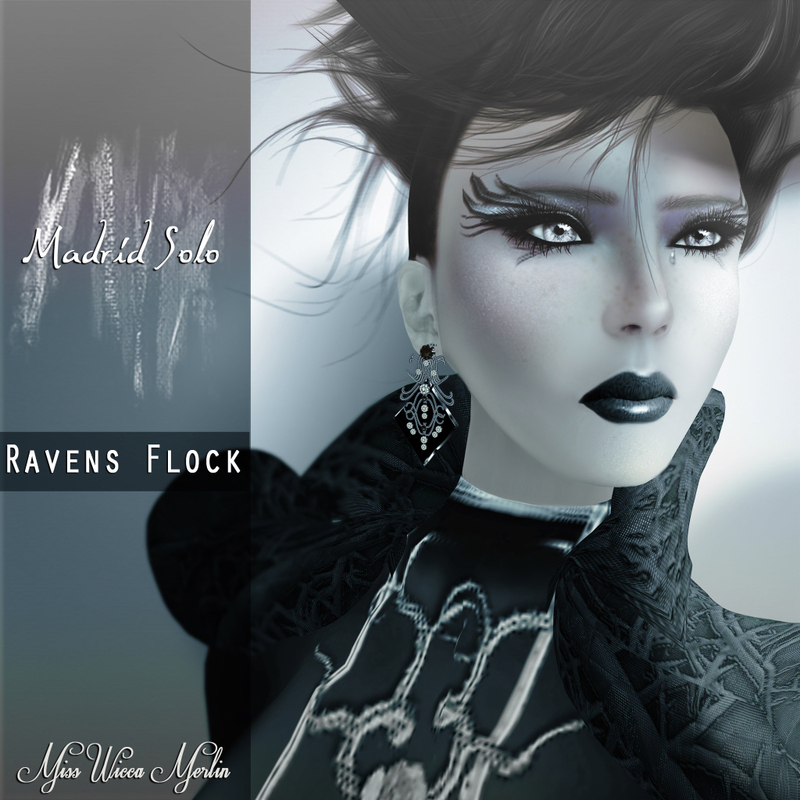 For this look Madrid Solo‘s “Ravens Flight” makes the perfect addition. Again we see some very filigree and amazing fine lines beside and below the eyes and this time you have 3 red parts that go upon the eyes. 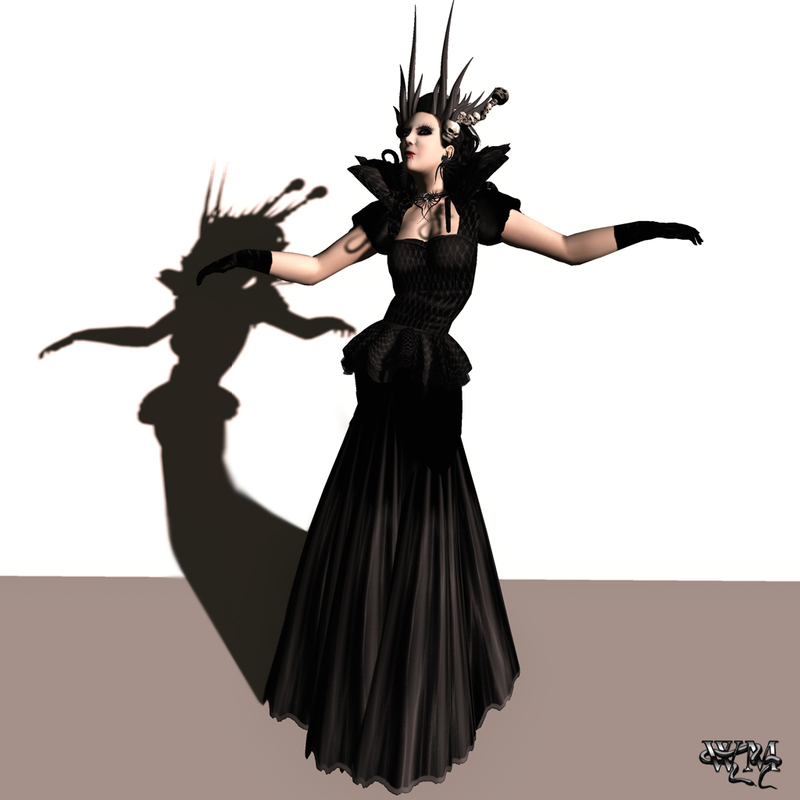 The last outfit for today would be the club version of the “Ravens Collection” A wonderful fresh but still chic looking dress with wonderful parts for wrists, neck and shoulders. You again have the option to choose from 3 versions for the top. Sheer, opaque and one, that only has the beautiful silver lines on it. 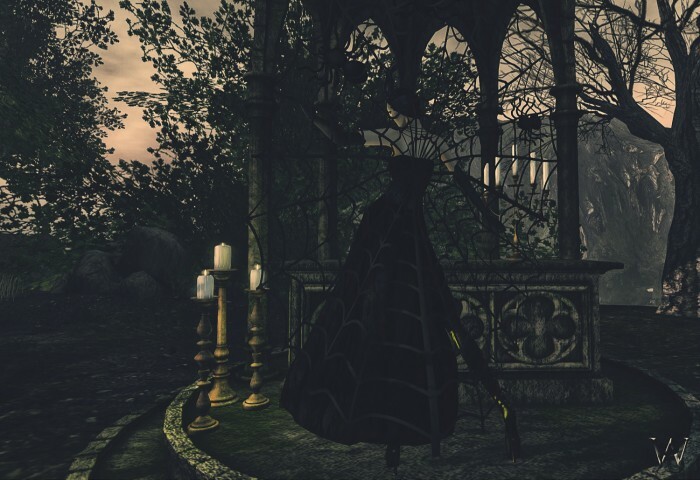 As well on this look you can see the boots that Rfyre made for the “Ravens Collection”, to match all of the outfits. 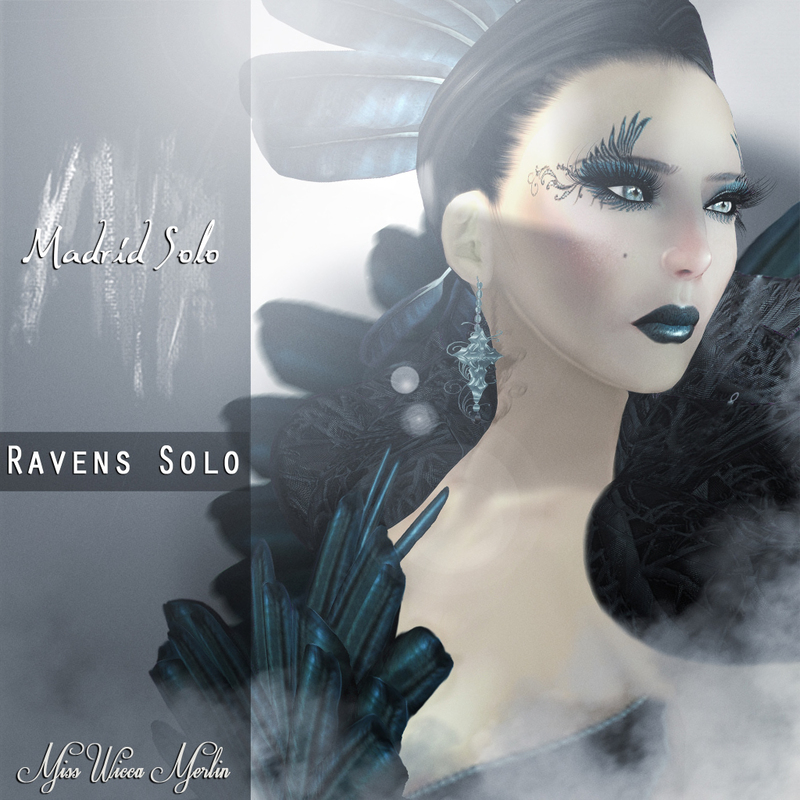 The last of the 3 “Ravens” makeups of Madrid Solo would be the “Ravens Flock”. Not as huge and filigree with lines beside and above the eyes this makeup made the perfect club look for me. Still a touch of elegance but a very cool look with the silver/teal parts upon the eyes.